Note: all content types record a workflow. But you will need to configure them to have versioning enabled/disabled. For this, go to the Site Setup ->Types ->(your file type)--Type settings. And in Versioning policy select one of the options (Manual, Automatic). By clicking History, a popout dialog will appear with all the previous versions and item’s submission history. When editing an item, you may use the change note field at the bottom; the change note will be stored in the item's version history. 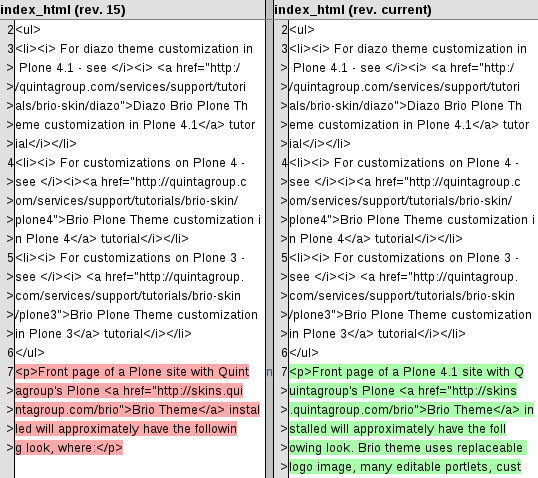 By default Plone includes a note: "Initial Revision". A new version is created every time the item is saved. To view previous versions of the content item, click View. At the top of the page all the previous versions are listed. Plone 4 also allows you to compare your edited version with previous or current one by clicking Compare link located between two adjacent versions in the History viewlet and then selecting one of previous versions from the list or Compare to current version respectively. In this example, text in red has been deleted, text in green has been added to the newer version. You can switch between inline and as code views of the differences in versions.